Energy Changes in Chemical Reactions. System loses heat (negative); gains heat (positive) Describe the difference between the two. 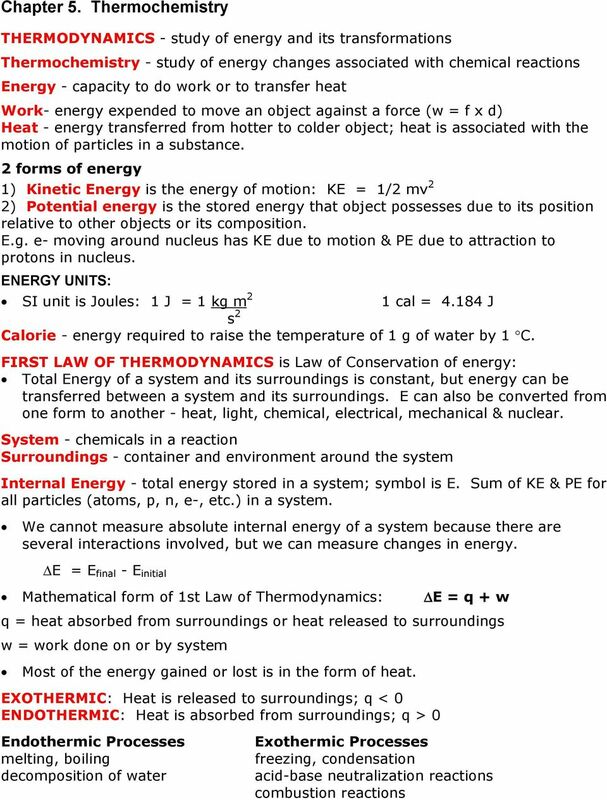 17 THERMOCHEMISTRY SECTION 17.1 THE FLOW OF ENERGY HEAT AND WORK (pages 505 510) This section explains the relationship between energy and heat, and distinguishes between heat capacity and specific heat. ENERGY. Thermochemistry. Heat. Temperature & Heat. Thermometers & Temperature. Temperature & Heat. Energy is the capacity to do work. Calorimeter: A device in which the heat associated with a specific process is measured. Thermodynamics: First Law, Calorimetry, Enthalpy. Calorimetry. Calorimetry: constant volume. Monday, January 23 CHEM 102H T.
The first law: transformation of energy into heat and work. Chemical reactions can be used to provide heat and for doing work. Example. 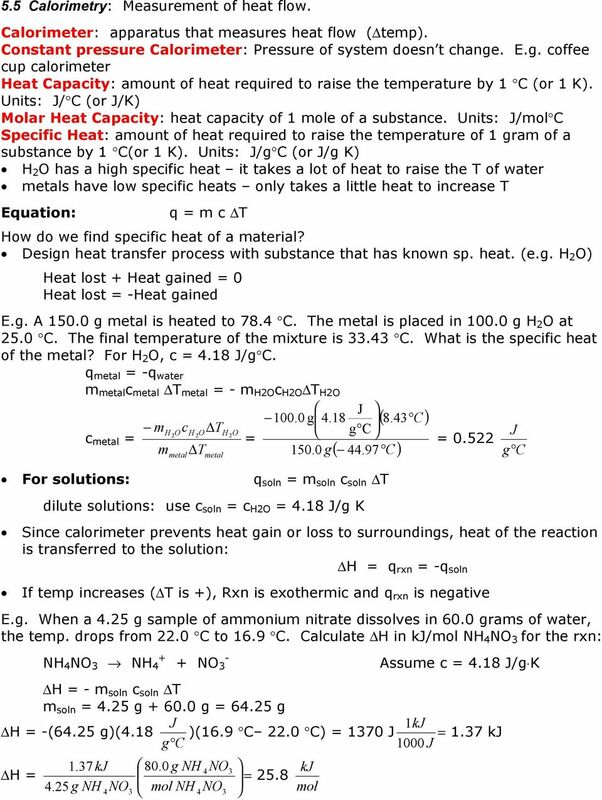 c. Calculate the amount of heat (in kj) required to heat 1.00 kg (~1 L) of water at 25 C to its boiling point. Procedure. Day 1 - Calibration of the Calorimeter. (Part I) The Heat Capacity of the Calorimeter. Thermochemistry is study of changes in energy (heat) associated with physical or chemical changes. 6 Absorption of Heat According to the First Law, E = q + w = q - P V, assuming P-V work is the only kind that can occur. Therefore, E = q V. The subscript means that the process occurs at constant volume. Outcomes EXPERIMENT 9 Thermochemistry: Hess Law and the Heat of Formation of MgO After completing this experiment, the student should be able to: 1. Differentiate between exothermic and endothermic reactions. AP Chem Lab 2 Quiz #1 Calorimetry. Conceptual Understanding. Write complete sentences to show your understanding. 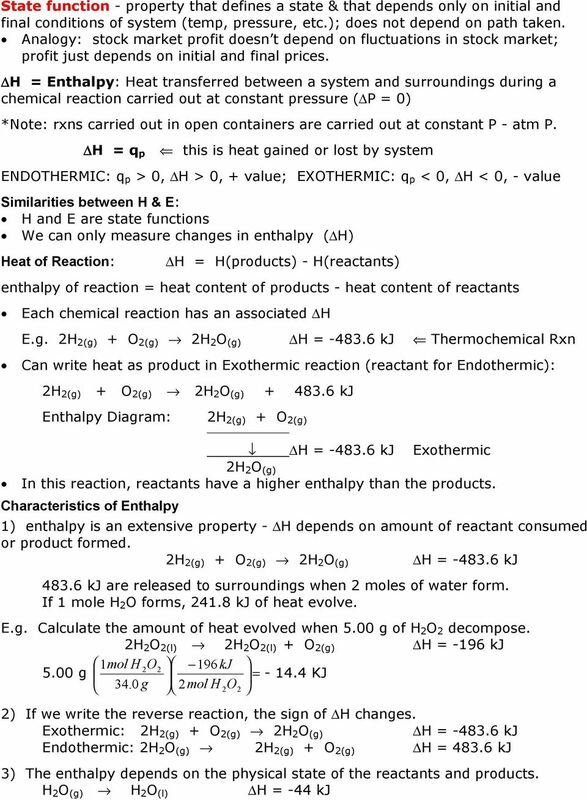 ENTHALPY CHANGES FOR A CHEMICAL REACTION scaling a rxn up or down (proportionality) quantity 1 from rxn heat 1 from Δ r H. = 32. Chapter 20. Thermodynamics p. 811 842. Spontaneity. What have we learned about spontaneity during this course? Unit 5 Practice Test. Name: Class: Date: Multiple Choice Identify the choice that best completes the statement or answers the question. 3A Energy. What is chemical energy? By adding Equations 1, 2, and 3, the Overall Equation is obtained. 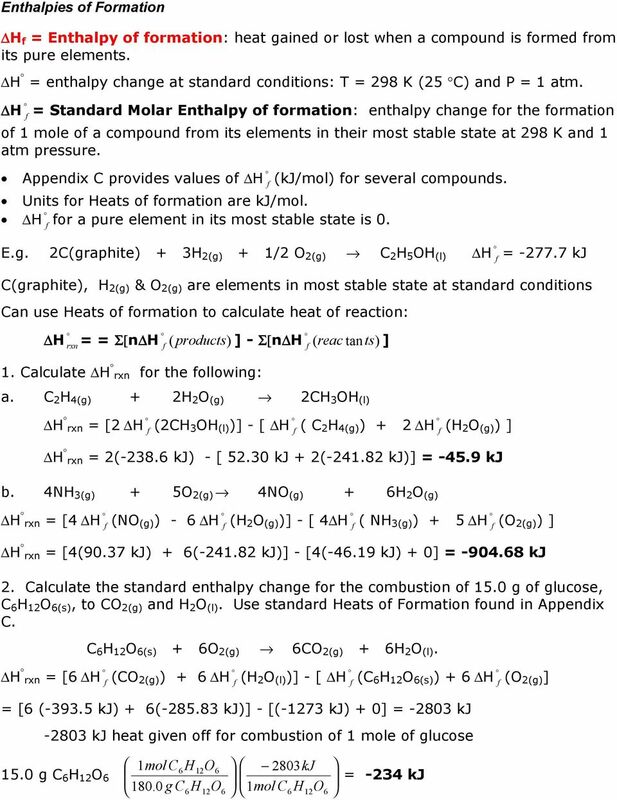 Summation of their enthalpies gives the enthalpy of formation for MgO. Form A. CORRECT: As gases mix, the disorder or number of microstates with the same energy increases. As a result, entropy increases as well. Chemical Equations C5.6b Predict single replacement reactions. 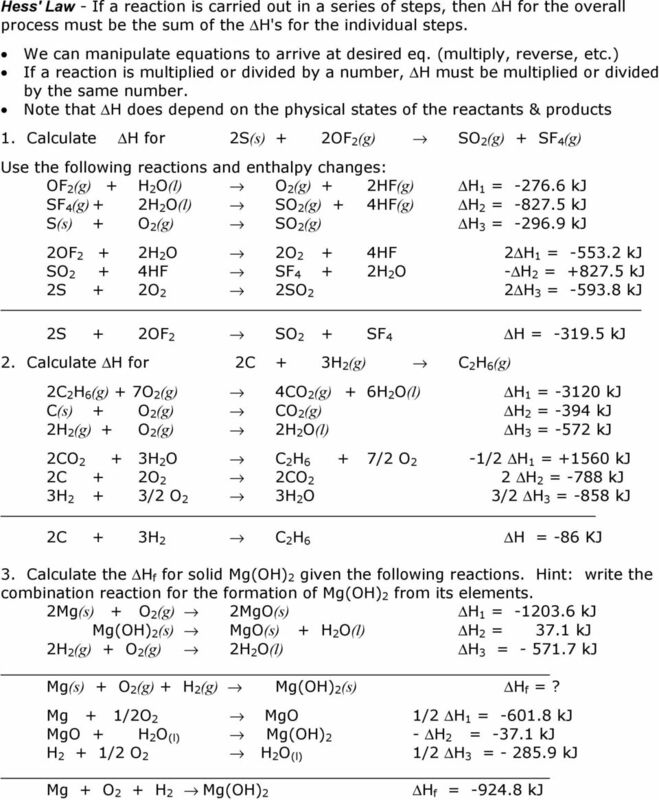 Chemistry 2SEM Chemical Equations C5.6b Predict single replacement reactions. Common Assessment Review Predict the following single replacement reactions: a. Zn + Pb(C2H3O2)2 ----> Pb + Zn(C2H3O2)2_ b. As long as the relative ratios are constant the amounts are correct. Using these ratios to determine quantities is called Stoichiometry.